Stop what you're doing! 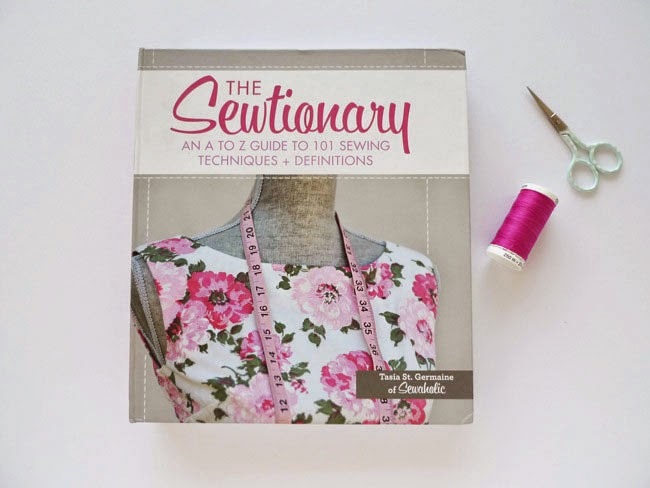 Have you seen Tasia Sewaholic's new book, The Sewtionary? Aaahhhh you need this baby on your book shelf! Congratulations on your wonderful book, Tasia! What's the idea behind the Sewtionary? How did you come up with the concept? 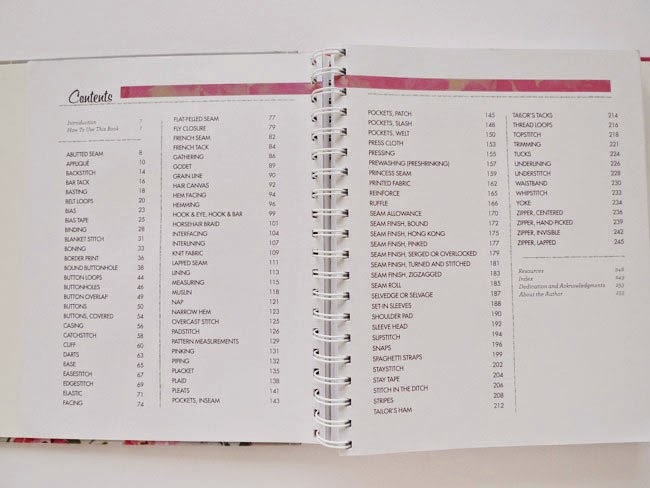 "The idea behind the Sewtionary is a sewing dictionary: sewing + dictionary = sewtionary! I'd originally started a page on my blog back in 2010 with all of the sewing tutorials and blog posts that were good reference posts. The more blog posts I wrote, the harder it was to find these posts and I didn't want all that useful information to get lost. (Here's the first post about the Sewtionary page.) Over the years I added more posts to the Sewtionary page, listing them in alphabetical order for easy reference. Then in fall of 2012 I was contacted by a publisher who saw the Sewtionary page on my blog and thought it would make a good book idea! After the initial conversation with the publisher, the next step was to write a proposal for the book concept. I went to the local bookstores to see if there were any books like it, and there really weren't a lot of solid, in-depth reference books and none organized in an easy A-Z format. 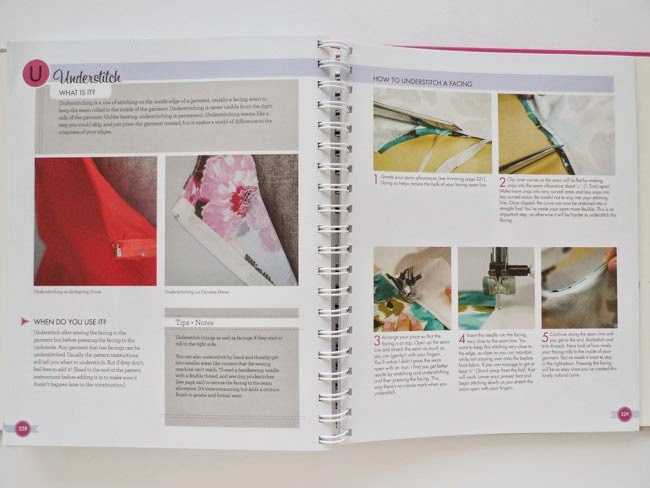 I added 'coil-bound format' as another important selling point, and 'pictures for all sewing steps' as another. Basically, I wanted it to be very easy to visualize yourself following the directions. I felt like photos of real fabric and thread would convey that message best." Going from writing your own blog to working with a publishing team is an eye-opening experience. Was there anything about the publishing process that particularly surprised you? "Absolutely! I think the two biggest surprises were: the short amount of time you have to write a book, and the number of people that are involved in the process. I'd originally thought that you get years to write a book! I had nine months from contract signing to final deadline. (I joked that it was like my baby, because of the nine month time period.) And that included time to do all the sewing for the samples, too! Such an eye-opening experience, like you said. The other thing that was different was working with print format and deadlines. When you blog you have the luxury of posting whenever you like and deciding how long or short you want your posts to be. There's unlimited space on a blog to post as many photos as you want. With a book everything has to fit in the space allotted, you have to choose photos selectively rather than adding as many as you think will illustrate the point. Also with blogging, it's so informal and quick. I take a photo and post it the next day. 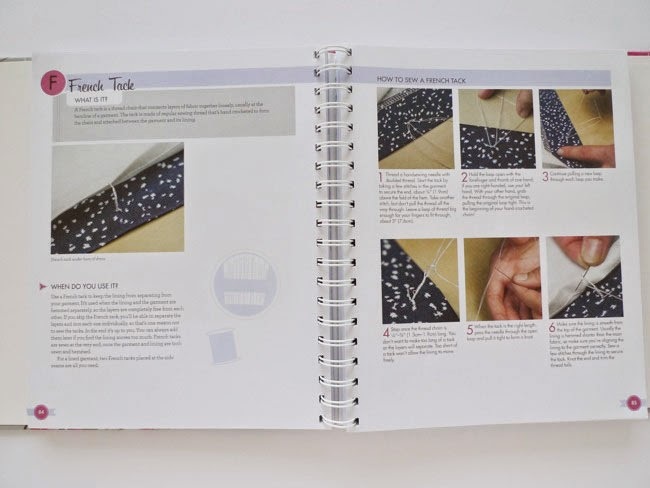 With the book, I had to carefully prepare all of the sewing step samples, and then wait for the photographers to take the photo, and then wait weeks or months to see it in its place on the book layout. Organization is so critical for the book process." What part of creating the book did you enjoy the most? "The beginning and the end. 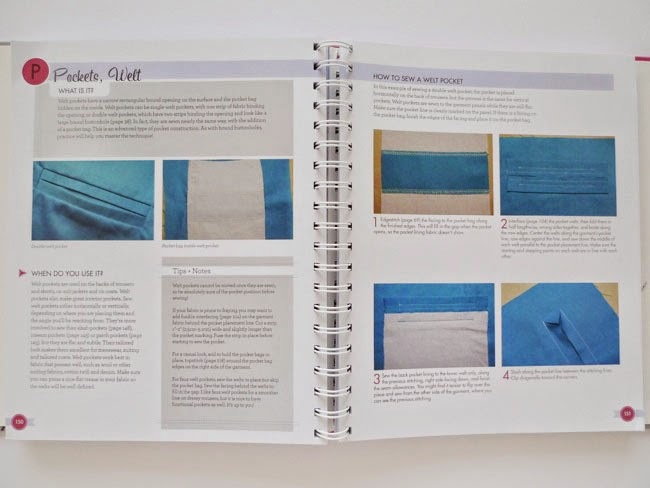 I enjoyed the initial planning, including choosing the fabrics for the book samples, narrowing down the terms and definitions, thinking about all the cool things and examples I'd include. I like being organized and I set up all these methods to keep on track, such as a bulletin board with all the terms so I could move them from 'to do', to 'in progress', to 'done.' I was still so amazed that I was really going to be writing a book! That was a fun time. The middle part was intense because once I'd decided to sew everything for the samples, I'd committed and there was no going back! That was a lot of sewing and a lot of preparation. And now I am really enjoying the fact that it's out in the world! I love hearing feedback on the book. I enjoy the reaction when people open it up and realize what I was working on the whole time. This may sound funny but I'm so happy that it made it all the way through from start to finish! There's always a chance that your project could get cancelled or worst case, that you don't make your deadlines. I'm so glad that it's a real book now!" What part did you enjoy the least? "About three-quarters of the way to the end, when it was July and beautiful outside and I had four hundred samples still to sew and I was so worried I wouldn't get everything done on time! I was worried I'd taken on more than one person could possibly handle. It's a lot of pressure writing a book. It takes a lot of sacrifice in other parts of your life - I bet you know all about that too! I'm so lucky to have an understanding partner and family and friends who didn't hate me for disappearing for nine months or so. I wouldn't have changed a thing as writing a book has been a lifelong goal, but there certainly were challenging moments throughout the process." Juggling running a business with writing a book is a huge challenge! How did you manage your time to ensure you could do both? "You bet it is! Plus I was keeping the book a secret until it was ready for preorder, so I had to try and keep on going like things were normal and I wasn't working on this major project the whole time. I admit I probably didn't do the best job of managing my time to be efficient at both. Instead I worked every weekend and every night into the evening like a madwoman. If I were to write another book I'd do a better job of organizing my time so I could work more calmly! I'd ask for help sooner as well. I'm quite determined (or stubborn, whichever you prefer!) and it's hard to admit when I need help. I also kept things going at a pretty hard pace for the first part of the year, putting out three patterns, and then I hit the point where I knew something had to give. 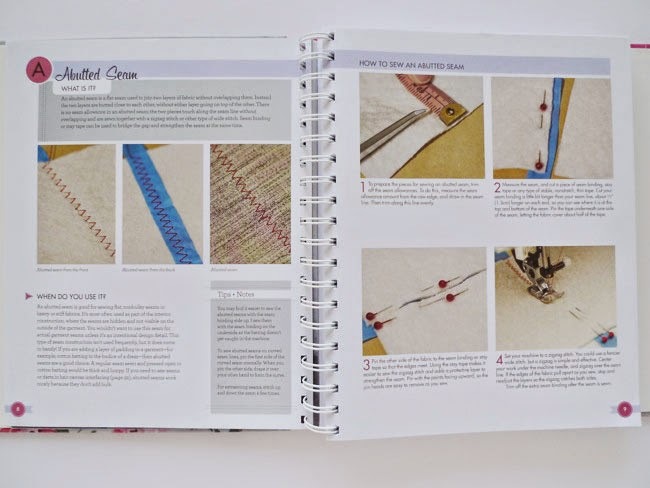 The book was the priority so I put pattern development on hold until it was done." What does the next few months hold for Sewaholic? "We're hiring! I'm bringing on a Design Assistant to ramp up new pattern development. I'm super excited to have help because we have so many ideas, and not enough time to get them fully developed into complete patterns. We're also working on making all of our current patterns available in downloadable PDF format, so people can choose from printed or PDF patterns. We're restocking our popular 'Handmade with Love' and 'One of a Kind' clothing labels which I love and use in all of my projects. And lastly, we're working on exciting new pattern designs for 2015. Look for a line-up of patterns next year that range in skill levels and are designed for different parts of your life, from modern office wear to clothes you can wear on your bike!" Huge congratulations, Tasia! Readers, you can find out more about the Sewtionary on the blog tour that's happening right now, and you can order the book from Tasia herself, from Amazon UK and all sensible bookshops. Go acquire! And if you enjoyed hearing about the process of book-writing, you might like my posts Behind the Scenes: Writing My Book and Getting a Craft Book Deal. Enjoy! Behind the Scenes... Studio Tour!